Thanks to the West Coast Regional Tourism Organisation for the map. 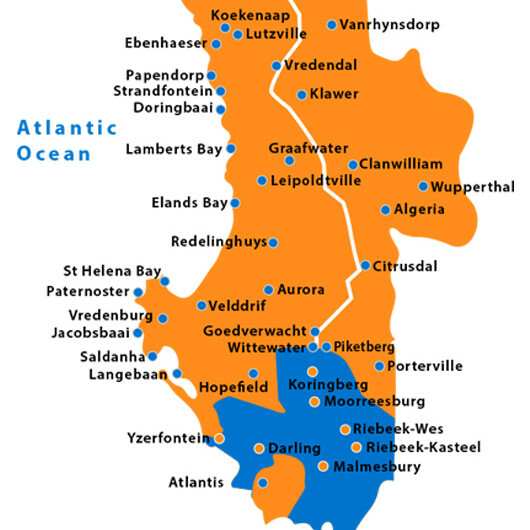 This is the gateway to the West Coast and the most southerly of the sub-regions, with Malmesbury being a mere 64km from Cape Town. It is best known for its undulating yellow wheat fields, interspersed by vivid green vineyards. The land has for most of its recorded history, been used for large-scale wheat farming and has become known as the breadbasket of South Africa, with wine-and olive production becoming more prominent. Moorreesburg is centrally situated in the West Coast, the Swartland area and is known for its wheat as it is the oldest wheat growing area in South Africa. 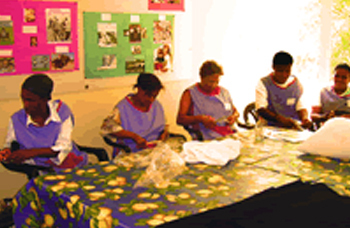 Facing the problem of unemployment amongst women, Susan Lerwick started this project in 2005 to address this issue.The first workshop started in January 2005 and the students undergo training in Domestic Service and Hospitality as well as Personal Development. The project also secures work placements for the students and until now they have trained 93 students and 85% have found employment. Some of them have studied further in computers and nursing.WCCF assists with funding for the training of the students.